Here are 25 fun facts about postcodes that you might not know. You never know one of them migh come up inthe next quiz you take part in. The Queen has a unique postcode for Buckingham Palace, SW1A 1AA. Even Father Christmas has his own postcode so he can receive all those sacks of Christmas lists. It is SAN TA1 (in Canada it’s HOH OHO ...) and letters sent to this postcode actually do arrive. London was the first city to see the beginnings of post coding. In 1857 it was divided into 10 postal districts based on compass points: N, NE, E, SE, S, SW, W, NW, EC for East Central and WC for West Central. Nowadays NE stands for Newcastle and S for areas of South Yorkshire and Derbyshire around Sheffield. Liverpool was the first provincial town to be divided into postal districts in 1864, followed by Manchester. Numbers were first added to the postal districts to create ‘sub-districts’ in 1917 to help the woman who took over the sorting work while the men were fighting in the First World War. It wasn’t until 1959, when the post office began to experiment with sorting machines, that Norwich was selected to trial modern post codes. 150,000 addresses received a code of NOR followed by two digits and a letter. The late, great Labour minister Tony Benn was the Postmaster General who decided to extend the postcode system to the whole of the UK in 1965. The eight-year programme to create a postcode for every home in the country began in Croydon 1966 and finished 40 years ago in 1974 with the recoding of Norwich. The postcode HD7 5UZ in Huddersfield, West Yorks, covers seven streets, more than any other in the UK. In 2008 Liverpool and England star Steven Gerrard built a new two storey gym in his back garden in the Merseyside suburb of Freshfield. It was so big it had a different postcode to his house. Britain is one of seven post coding systems in the world that use an alphanumeric system - a combination of letter and numbers - which allows a greater number of unique combinations to be used. The combination of letters and numbers was also chosen because people can remember a mixture of numbers and letters more easily than a list of numbers. Optical recognition machines read the postcodes and automatically convert them to phosphor dots. These are in turn read by the sorting machines which handle correctly addressed mail, post-coded letters 20 times faster than manual sorting. The Girobank at Bootle in Liverpool was given its own postcode, GIR 0AA, that did not fit into the standard, geographical system. The postcode was taken over by its successors Alliance & Leicester and is currently used by Santander. In comedy Red Dwarf, the space ship is the size of a city, and has the fictional postal address complete with postcode: Red Dwarf, Deep Space, RE1 3DW. The furthest point from the sea in the UK is Church Flatts farm near the village of Coton in the Elms, which lies in the DE12 postcode area in Derbyshire. he British Forces Post Office has its own postcode, BF. Postcodes have been adopted by countries around the world and 117 of the 190 countries in the Universal Postal Union have postcode systems. In India they are known as PIN (standing for Postal Index Number) codes, and in the United States as ZIP (Zone Improvement Plan) codes. One of the most famous zip codes is Beverly Hills 90210 - the same as a teen TV show. It is also one of the wealthiest areas in the US. Countries without postcodes include Jamaica, Ghana and Hong Kong. The Royal Mail uses the imaginary postcode prefix FX for training purposes. Westfield Shopping Centre in Stratford, East London, is so big it has its own postcode, E20, which was previously the fictional location for BBC soap EastEnders. 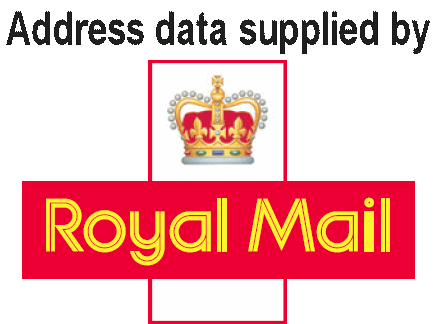 There is no danger of the UK running out of postcodes anytime soon. The current alpha-numeric system has enough potential combinations to create 48million postcodes.